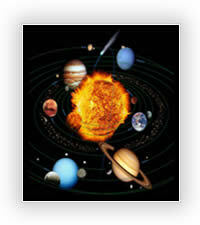 The planets in Vedic Astrology are called Grahas which means ‘to seize’ or ‘to take hold of’. They represent forces that have influence on us in different ways. In Sanskrit, the word Shakti has to do with energy or power. It is related to the feminine aspect of Divine Consciousness. Shakti has to do with the manifestation and creation of everything in the universe. It’s nature is to create and manifest things. All of the planets have their own kinds of Shaktis, which by their very natures, want to manifest things, one way or another. The nine planets are always affecting us. Sometimes we go through periods where one or some of the planets are influencing us more than others. And in our natal birth charts there are planets that are more influential or more dominant than others. 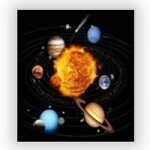 The planetary mantras are tools to work well with the energies represented by the planets. The mantras help us to raise our level of awareness of these energies and to more consciously use these energies in our lives. As we go about our daily life, we don’t have to be thinking of our actions, drives, urges, reactions, etc. as being caused by this planet or that planet. But what can happen is that we become more aware at any particular moment that we have a choice of whether to react or not. Each planetary Shakti can manifest (with us participating) in relatively conscious or unconscious ways. For example, when we are under a strong influence of Saturn, we can naturally react with resistance, frustration, getting a little negative, just feeling really stressed, or Vata provoked in Ayurvedic terms. We can even feel physically tired or have more health challenges. When we consciously use the planetary mantras and the positive qualities of Saturn, then we can be very focused, very present and clear, very confident, organized, patient, practical and have very good structures and routines in life. These conscious ways of using the Shakti of Saturn leave less and less Shakti or energy to manifest in some of the difficult ways that it can. In my experience of doing the planetary mantras, I sometimes become more clear on things while doing the mantras. It is as if the deity of a planet is providing some grace or a blessing. When the mantras are done in the morning, they seem to ‘tune up’ the energies for the day and allow the day to go either more smoothly, more consciously, or both. I will also do a specific planetary mantra to help me with some of that planet’s positive qualities. I may know, from doing astrology, that a particular planet is influencing me strongly during a certain period. So I might do extra mantra for that planet to help me to be more conscious and balanced during that time. It is very good to do the mantras in a group of people and feel the energy that is generated (or attracted). This becomes a very real experience of the planets.